Blueprint for Living: Mastering Your Mindset…Loving Your Life! Now Available! 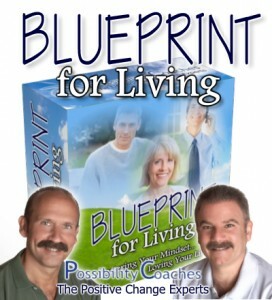 Blueprint for Living - The Online Version - By The Possibility Coaches. Click this image to learn more. Happiness, Success, Balance and Inner Peace Are An Inside Job! The Level Of Happiness, Success, Balance and Inner Peace You Achieve In Your Life Can NOW Be Determined By YOU! Friends, each of us comes with “baggage,” issues buried inside us that often silently defeat our chances for having happiness and success and feeling happier and more successful. Don’t despair! Creating true happiness and success is easier than you may think! With The Possibility Coaches’ Blueprint For Living Online Program, you have 2 of the most powerful Success Coaches teaching you everything you need to know to quickly and easily manifest your intentions, dreams and goals. This is a golden opportunity to create the life you’ve always wanted, but weren’t sure how to do it. To create balance in your life means to have satisfaction and contentment? To have inner peace means you know who you are, where you are going and how you are going to get there? To be successful, you don’t have to sacrifice your health, relationships or emotional well-being? Creating more happiness is a process and not a payoff; therefore are you willing to continuously grow and evolve as a person? IF THIS INFORMATION STIRS YOU JUST A LITTLE OR A LOT, then THE BLUEPRINT FOR LIVING is for YOU! YOUR… TERMS, SCHEDULE & PACE! The Blueprint for Living has been conducted in a live classroom setting since 2008. NOW, this same class, with ALL of its’ valuable content is available to YOU, online! This online version makes it easy for you to receive this information anywhere in the world, at any time, right from the comfort of your home. Discover your true purpose in this lifetime. Learn how to apply the Law of Attraction in your life. Realize the importance of “achieving results” versus goal-setting. Discover how to change and eliminate your self-limiting beliefs. Create a crystal-clear plan for success in your specifically chosen areas. Learn to prioritize your use of time to your best advantage. Develop a positive self-image and greater confidence. Understand the importance of taking responsibility for your life. Develop effective communication skills which are essential for true success. Break through self imposed limitations. Blueprint for Living, the online class that is changing lives is now available! Click here to learn more today.